Bryans Ball Catching Games, Payramid, Retreeva, Forks, etc. This category contains some of Bryans most wonderful games, indeed two of the best games ever invented: The Payramid and the Retreeva. Bryan's inventive skills came to the fore with this type of game. 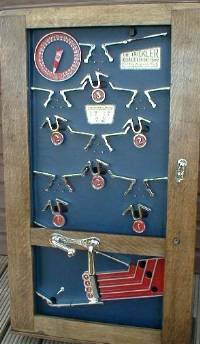 No other manufacturer could compete when it came to the invention of these purely mechanical games. The idea behind these games was to catch, or deflect, a number of balls into a winning receptacle. The machine would usually pay out according to the number of balls caught. Although these games are naturally thought of as skill games, they are really reaction testers - although none the worse for that. It is not generally possible to improve ones chances of winning by repeated playing, but of course the punter wouldnt know that! Winding the handle would raise the ten balls up to the top of the machine, in turn. 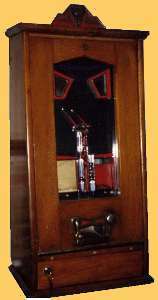 The right-hand handle was used to rotate the six catching cups, in an attempt to catch or deflect the falling balls. Any balls caught would appear in the scoring gallery at the bottom of the game. 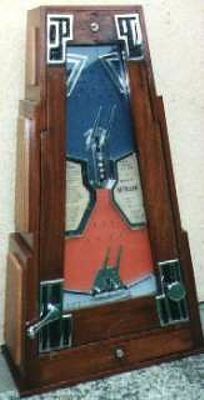 The score was also totalled automatically on the dial at the top. No payout was given, except by attendant. The top cup was the most difficult and scored a 3, the central cups scored 2, and the two bottom cups each scored 1. Trickler close-up details showing scoring dial, and instructions. The label underneath the 3 cup carries details of payouts provided by the attendant for scores of 25 to 30. Note that you would need to catch at least 5 balls in the top cup and all the rest in the middle cups to achieve the lowest winning score. 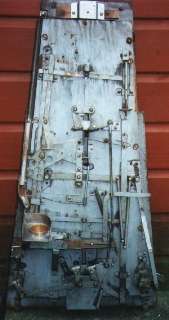 Above: Trickler Mechanism. 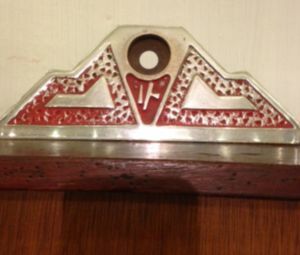 The connecting linkages to the 6 cups can quite clearly be seen. 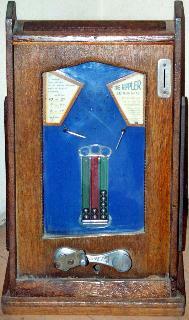 In this game, ten balls would fall from the top of the playfield. 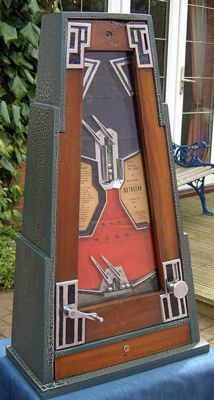 The player would rotate the two paddles in the centre of the playfield in an attempt to deflect them into the central column. Scoring was achieved manually, and there was no payout. Any awards were obtained from the attendant. In the 90s, a collector obtained some surplus Rippler parts and castings from the Bryans factory and set about making a small run of reproduction machines. The quality of these was very good, and all but indistinguishable from the originals (apart from the age of course). These reproductions are now becoming just as collectable as the original Ripplers. 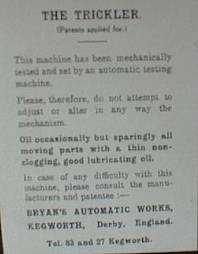 Although they weren't made at the Bryans factory, they do contain some original Bryans parts. coins or a prize. The object was to deflect six balls into the central column. 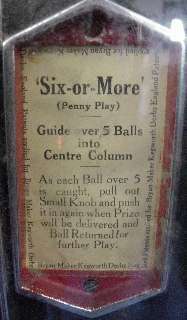 "Guide over 5 balls into centre column. As each ball over 5 is caught, pull out small knob and push it in again, when prize will be delivered and ball returned for further play." There is no doubt that the Payramid is one of the greatest slot machines ever invented. The game is a true classic, and a tribute to the inventive genius of William Bryan. The Payramid was introduced in 1934 and was still being made 40 years later. 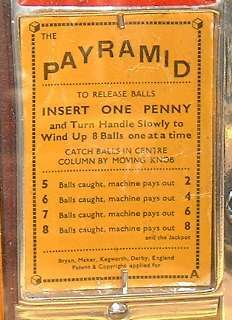 It is Bryans most popular ball-catching game, and no penny arcade in Britain would have been complete without at least one of these frustrating games! There is a special page devoted to the Payramid. 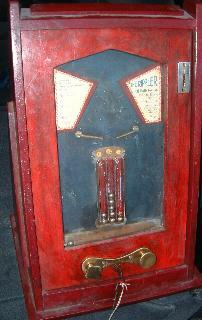 The playfield holds eight balls, which all drop to the bottom upon the insertion of a coin. 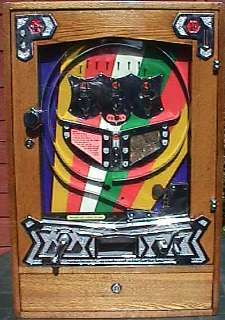 As the player winds the handle on the left, each ball is raised in turn and is fired out at the top of the playfield. 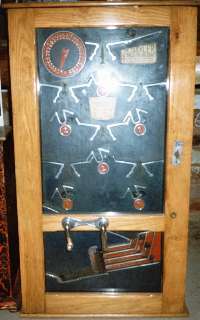 The idea is to catch as many balls as possible between the moving fingers by manipulation of the knob on the right-hand side of the machine. If five balls are caught the machine pays out 2 coins, six balls pays out 4, and seven balls pays out 6. If you catch all eight balls you get a payout of 8 coins, the visible jackpot opens, and you also get a free ball, which delivers a further 2 coins each time it is caught. The difficulty level can be continuously adjusted by varying the gap between the fingers. The payout can be adjusted by varying the number of balls in the machine, from 5 onwards. Payout adjustment. The payout mechanism is entirely automatic, and operates in the background during play. The excitement of the game is thereby enhanced considerably by the sound of pennies dropping into the payout tray as each ball is caught! 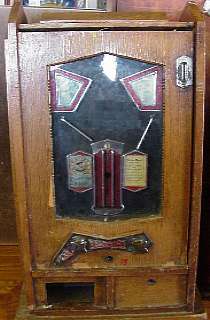 The jackpot automatically reloads itself from a percentage of the coins going into the cashbox. The Payramid is much sought after by collectors. As well as being fun to play, the game looks right - with its symetrical playfield, chrome features, jackpot full of shiny pennies, and the 8 balls always on display. It is the perfect combination of wood, chrome, balls and coins. 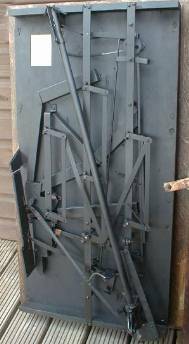 Value: £1400-1800 See the special page devoted to the Payramid. 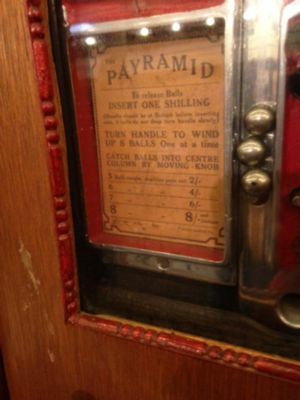 The Payramid was also available in a 'Travelling' case. 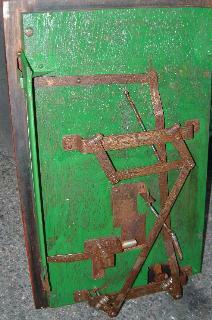 This was a less ornate but stronger case, intended for travelling showmen. The Payramid was redesigned slightly in 1960. 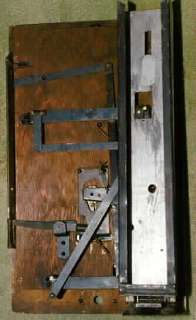 The early versions have a removable side panel to gain access to the cash box, which was mounted behind the mechanism. 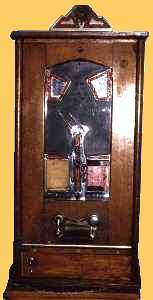 The later version had the cash box in a separate lockable compartment, which can be seen at the bottom of the case. 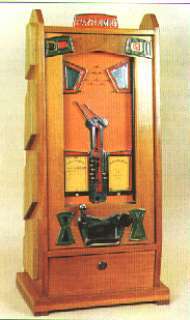 Various other minor alterations were made to the case, the coin entry, and the arrangement of the pins on the playfield. The mechanism was simplified considerably. Notice that the example shown here has the jackpot feature disabled. See the special page devoted to the Payramid. 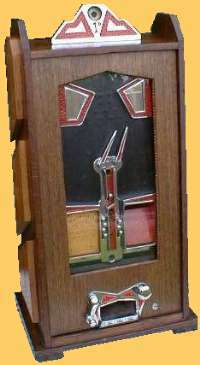 The 1960 version came with 6 different award cards (A-F) and instructions for changing the payout. 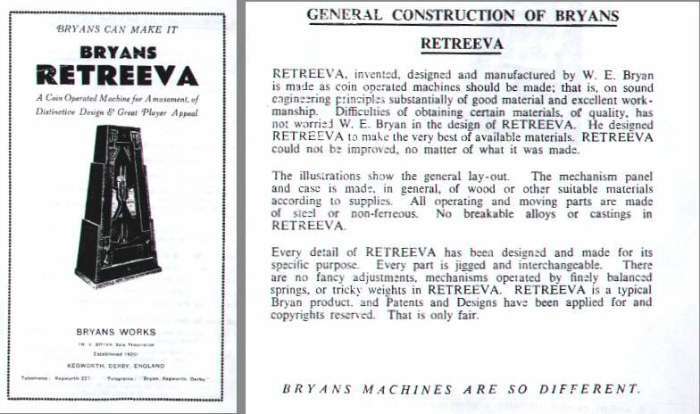 The Retreeva was the first Bryans machine to be introduced after the war, and was probably meant to replace the Payramid, which was then a 12 year old design. Like the Payramid, the Retreeva is a masterpiece of classic design, both internally and externally, and one of the greatest games ever made. 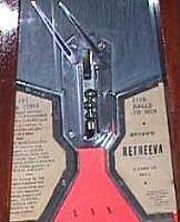 The Retreeva was designed to overcome a flaw in the Payramid's gameplay. With the Payramid, if you miss four balls the game is effectively over because you cannot win. Further play then becomes pointless, as even if you catch every one of the remaining balls you will still win nothing. The Retreeva gets around this problem by allowing the player to 'Retrieve' any lost balls and replay them. In essence, the Retreeva consists of two Payramids mounted one above the other. 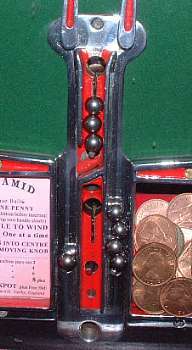 When a coin is inserted and the handle turned, the five balls are released and raised up one-by-one to the top of the playfield. 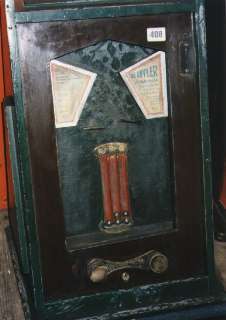 In true Payramid style, it is the players task to catch the descending ball between the pair of moving fingers at the top of the machine. If a ball is missed, it falls through to the second playfield where he gets a second chance to catch it between the lower pair of fingers. The balls caught by the lower fingers actuate a mechanism which releases all the missed balls and brings them back into play again. 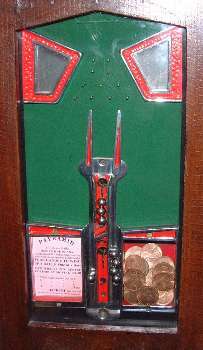 The ultimate object of the game is to catch all five balls between the upper set of fingers, whereupon the player is rewarded with a payout, and another game. 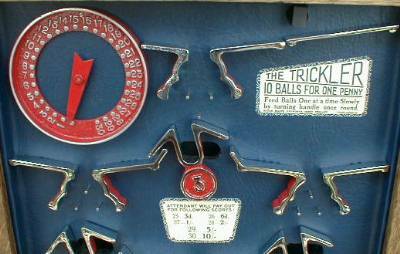 Although you only get five balls as opposed to the Payramids eight, the balls are constantly re-cycled. So in fact you usually get many more than five balls in a game, and the game can last much longer. Strategic play is also necessary, as it is often advantageous to deliberately avoid catching the ball in the top fingers and allow it to pass through to the bottom playfield, where it can be caught (hopefully) and release more balls for play. Widening the gap between the upper fingers makes for an easier game, whereas widening the gap between the lower ones makes for a longer game. Unfortunately, the Retreeva is let down by its unexciting payout. Compared to the continuous payouts of the Payramid, the Retreeva only pays out if all five balls are caught, and then only returns the player's coin. There is no jackpot either. However, the thrilling gameplay does offer some compensation for any lack of financial reward! Despite being such a brilliant game, the Retreeva never caught on with the general public, who found it too complicated to understand and appreciate. Consequently, only 179 Retreevas were ever made. The Retreeva's entertainment value, striking art-deco styling, and rarity make it one of Bryans most sought-after machines today. 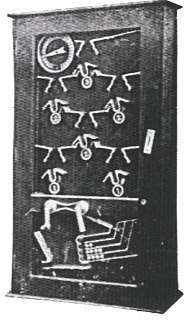 It is somewhat curious why William Bryan chose to solve the various mechanical problems in a completely different way from those in his own Payramid patent of 1934 (which were in no way unreliable). Instead of arranging for the balls to fall through holes and operate the mechanisms directly, here the positions of the balls are detected by mechanical links which project through slots in the playfield. Consequently, the balls remain on the playfield at all times (except when they are being lifted by the ball lift). One advantage of this method could be that the balls do not come into contact with any oil and grease in the mechanism. Part of the Retreeva sales leaflet. The Retreeva was introduced immediately after the war, hence the references to material shortages and difficulties. Almost certainly the most feature-packed Allwin ever produced, the Forks is a cross between three Payramids side-by-side, and an Allwin! 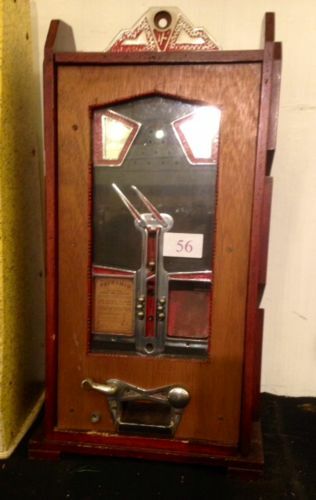 It also includes a playfield jackpot. Instead of the balls being wound up to the top of the playfield by the player, they are shot around a spiral track. 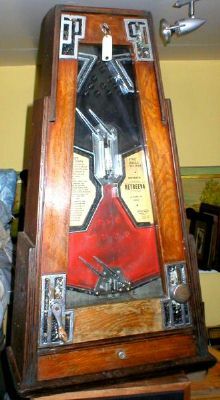 The knob on the left-hand side of the playfield controls the rotation of three forks which the player manipulates to try and catch the balls as they fall. The machine pays out two coins for each ball caught, plus the jackpot if all three balls are caught. In theory this should be a very special game, but the ball catching feature is less satisfactory here because the catching forks are near to the top of the playfield. Consequently, the player does not get a chance to follow the ball as it trickles down, and the positioning of the Forks is mostly hit-and-miss (mostly miss!). This can make the game very frustrating, especially as the width of the forks cannot be adjusted. It also needs three hands to operate! Despite this, it represents the pinnacle of Allwin development, and is an engineer's delight!